For my tv remote that I bought this for, this worked great. But my new tv, oddly has a remote that doesn't have a switch or buttons to change what device it's sending signals too. Originally I could switch my remote to DVD, which I had the codes set for for my FLIRC. Then I could change it back to TV and it wouldnt mess up anything on my computer if I was hitting the arrow keys or Enter key. Now though, my remote doesnt have this option, and when I'm cruising through the Netflix or Amazon video lists it's messing with my PC too. I don't think there is, so I'm asking for it, could we get a button to enable/disable the rest of the keys in the FLIRC? Here's the remote. I could use the "yellow" key to disable/enable the flirc, because as far as I can tell, it doesn't do a darn thing. How come you could switch functions before but can't anymore? So, what do you guys think? Because as I see TVs becoming smarter, I can see the remotes becoming more like this. My new TV has Amazon video, Netflix, Vudu, all that stuff, and Im pretty sure there's an option for controlling the optical output volume as well so I wont need my stereo remote for anything more than to turn it on. With this level of programmability being introduced into televisions there is little need for that old "TV/DVD/SAT/AUX" switch anymore, and thus a growing need for an Enable/Disable function. For now, could someone come up with a script that could run on a macro such as "Win+[" or something that could disable all other keyboard keys until the combo is pressed again? I'm going to squeeze this into the next release that's well over due, but coming shortly. I am having the exact same issue so I went searching for it and came across this post. Has this function been added? It's been a while. I'm currently using my Panasonic TV remote to control XBMC on my always-on HTPC running SABnzbd and functioning as a ghetto NAS. A button to turn the flirc on/off would be perfect so I don't mess up everything every time I just want to watch TV. Not as yet I don't think but Jason has promised, he works very hard. Unfortunately not. Where long-press functionality is mentioned in the beta's it relates to the ability for flirc to be more responsive and detect when you're scrolling (not pressing the button multiple times). Oh, sad to hear that. It seems like flirc is not yet for me, I will try to find another solution and check back on progress in a few months. Thanks a lot for your help, you're a real boon to these forums. We want Flirc to be useful to you. 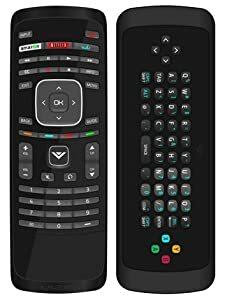 I have a similar remote to the one pictured above. A disable/enable feature would be very helpful. Did this get included in one of the recent updates? Don't think so - I think Jason got bogged down in an issue with one of the features. This would also be extremely useful for my setup. Right now if I need to change my TV options (e.g. change scene modes) it collides with my xbmc box. So add my vote. It's been about a year since Chris answerd. Do you have any news about this feature? I'm sure it would be really helpful for users with TV remotes. Jason, any word on this? I will incorporate this feature. But I wont be free to do so for 3-4 weeks. My remote only has "TV function", not DVD/SAT so being able to turn on/off FLIRC would be very important for me. Awaiting FLIRC and an update to "improve" this. Configure one remote key to enable/disable flirc inputs -> This key would set a flag to 0 or 1.